The future of Microsoft is in the hands of the developer community, with the vendor making key platform changes to improve builder accessibility as Windows 10 adoption surpasses the 500 million device mark. 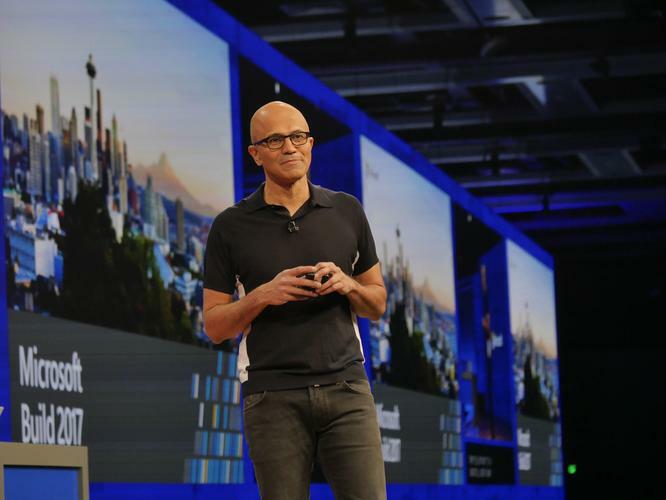 At the company’s annual developer conference, Microsoft CEO, Satya Nadella, revealed that Windows had reached 500 million Windows 10 monthly active devices and noted the combined software suite - Windows, Microsoft Office and Microsoft Azure - offered developers more than a billion opportunities to connect their innovations with Microsoft customers. Microsoft launched new Azure data and cloud services it said will help developers quickly modernise existing apps, new AI and Azure services that allow any developer to more easily build intelligent apps, with understanding and natural user interaction capabilities, and showcased new data, IoT edge and AI services built for a future with an intelligent cloud and intelligent edge. “In a world of near infinite compute power and an exponential growth in data, we are focused on empowering every developer to build applications for this new era of intelligent cloud and intelligent edge,” Nadella said. In addition, the company gave a glimpse of innovations which included a preview of Azure IoT Edge, technology that that Microsoft said extends the intelligence and other benefits of cloud computing to edge devices. For the database community, the software giant unveiled its new Azure Cosmos DB, built the company said from the ground up to run large-scale cloud services and data-intensive applications. Microsoft said developers would get “incredible flexibility with the only schema-free database service, with support for popular NoSQL APIs, that also offers five well-defined consistency choices while auto-indexing all your data". The Azure SQL Database improvements include a new Managed Instance private preview, general availability of Threat Detection and preview of Graph support, general availability of Visual Studio 2017 for Mac, support for containers and increased DocuSign support. Turning to its Office 365 platform, the vendor said it had plans to better connect the developer community to users. As a result, any developer can now publish for its chat application, Microsoft Teams and the company said in the near future apps in Teams will be more discoverable for end users through a new app experience. Developers can also add new capabilities to Teams apps, including third-party notifications in the activity feed, Compose Extensions and Actionable Messages. New Graph APIs were made available to developers, including APIs from SharePoint and Planner. For the cloud, the vendor said developers and ISVs who host their production SaaS applications on Microsoft Azure and sign up through the Azure website could now have their apps’ data and workflow automatically extended to authorized Office 365 customers through standard connectors for PowerApps and Microsoft Flow. In addition, it is also providing additional incentives to its sales force when they jointly co-sell eligible SaaS apps and services to enterprise customers. In regard to artificial intelligence (AI), the company added new cognitive services bringing the total to 29 services for developers. It said that enables developers to infuse off-the-shelf or custom intelligence capabilities such as vision, speech, language, knowledge and search into their app and bot experiences in any scenario. The new services include Bing Custom Search, Custom Vision Service, Custom Decision Service and Video Indexer. Also, a new PowerPoint add-in called Presentation Translator, which leverages Microsoft’s Translation APIs, was featured, allowing real-time translation to multiple languages during any presentation. The company’s new Cognitive Services Labs were also launched, enabling developers to experiment with new services, such as a Gesture API, still in the early stages of development. Using the new adaptive cards supported by the Microsoft Bot Framework, it said developers can write cards once that look great across multiple apps and platforms. Developers can also publish to new channels including Bing, Cortana and Skype for Business, and implement Microsoft’s payment request API for fast and easy checkout in their bots. Back in the cloud arena, Azure Batch AI Training is a new Azure offering, currently available in private preview only, that will allow developers and data scientists to configure an environment with parameters and run their models against multiple CPUs, multiple GPUs and eventually field-programmable gate arrays. More third party compatibility came to the voice recognition platform with Harman Kardon’s Invoke intelligent speaker with Cortana, partnerships were also signed with HP on devices and Intel on reference platforms to deliver Cortana-enabled devices. The Cortana Skills Kit is also now in public preview, a program with which developers can build skills for Cortana by creating a bot and publishing it to the new Cortana channel of the Bot Framework. This is available across Windows 10, Android, iOS and the new Cortana-powered Harman Kardon Invoke speaker, but only in the US for now.